The fall in the price of the pound indicates quite how much Scotland props up the UK economy. Something has rattled the City of London this week. With opinion polls showing support for Scottish independence closing in fast on the opposition, the pound “tumbled”, relative to the dollar, on Tuesday. The New Economics Foundation, where I work, doesn’t take a position on the Scottish referendum. It’s for the people of Scotland to decide their future. And while the City now appears to have woken up to the possibility of a Yes victory, it’s not uncertainty over Scotland’s future that’s troubling them. This is something of an understatement. The UK has run a deficit on its trade in goods every single year since 1983. We have imported more goods than we have exported every year for three decades. 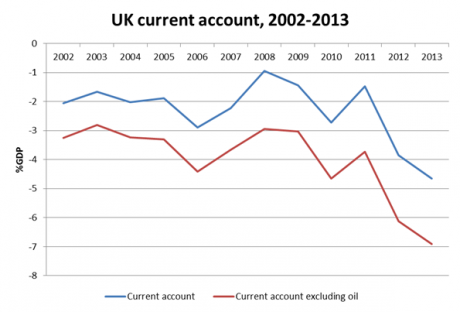 Including services and overseas earnings (the “current account”), the UK has run a deficit since the mid-1990s. Today, that deficit is close to record levels, at 4.4% of GDP. A country running a large current account deficit with a freely-traded currency should see the value of its currency fall. Fewer people abroad will be buying that country’s products, and so demand for that country’s currency will drop, bringing its exchange rate down. That fall in the exchange rate should, in turn, lead to rising exports (since they become cheaper for the rest of the world) and falling imports (since they have become more expensive), so closing the trade gap. That’s the theory; it hasn’t happened in the UK because we have an economy that has been extremely effective at covering for its deficit by borrowing from the rest of the world. Today, the UK holds the world’s second-largest external debt, behind only the US. The UK, collectively, owes 406% of its GDP to its overseas creditors. This deficit has been sustained, so far, because we have an extraordinarily large financial sector, a key part of the global financial system. The City depends on a high value pound for its own operations. Financial assets (and property) denominated in pound sterling are much more appealing when the value of the pound is high, and stable. (Never mind, of course, the consequences for those seeking to export.) One result of this is that the UK has the largest financial sector liabilities of any developed economy, relative to its size, at an extraordinary 1,634% of GDP. The status quo has worked very well for the financiers. In the good times, they have a vast domestic market for credit in the UK’s debt-driven economy. In the bad, they can rely on Westminster to bail them out, at extraordinary social cost. The chronic trade deficit is merely another source of demand for credit. Yet this chronic imbalance in the UK’s international trade is there even with North Sea oil revenues. These are, for now, substantial. In 2013, the UK sold £39.3bn worth of oil to the rest of the world. There are, obviously, questions about the sustainability of North Sea oil. It would be advisable for an independent Scotland to move rapidly away from a reliance on North Sea earnings, aside from its environmental costs; but in this respect, Scotland would be no different to any other developed economy in needing to end its carbon dependency. Should an independent Scotland claim, under international law, its fair share of North Sea oil, these export revenues will no longer appear on the UK’s balance of trade. Over the last year, the loss of North Sea oil would have bumped our current account deficit from 4.4% of GDP, to just under 7%. The graph below shows the shift over the last 11 years. The average deficit, over that time, was 2.3% of GDP. Without oil, this drops to an average of 4.1% - and the situation is clearly worsening. It is one thing to borrow from the rest of the world to cover a 2-3% deficit, over many years. But at 4-5%, and worsening? The volume of borrowing required would be astronomical; if Scotland keeps the pound, devaluation for the remaining UK (the obvious solution) would be difficult, since Scottish own exports would still be denominated in pounds. In any case, mobilising the external borrowing needed to meet the deficit is easier with a high value pound. It is not at all clear that any country could reasonably sustain an external position this bad, over any extended period of time. And it is this prospect that is troubling the City. It is not due to Scotland leaving that a “sterling crisis” may threaten. It is due to the UK’s economic problems. Cumulatively, between falling incomes and rising debts, these mean we are already “one shock away from a further crisis.” Whether it was Eurozone stagnation, Scottish independence, or own property bubble collapsing, this is an economy almost designed to fail – at some point, and from some cause. The City clearly believes Scotland is necessary to prop up the economic status quo. But this isn’t just a question of yes or no – the Scottish referendum is an opportunity for the whole UK to force open a debate about our hideously imbalanced economy: its failure to create decent jobs, its hopeless dependency on debt, and above all the damaging impact of the City of London.